This is the perfect ocean view vacation cottage for anyone looking to enjoy all that the village of La Jolla has to offer. Just 20 feet from the front door is Prospect street where you will find all of the amazing shops and world famous restaurants that make the village of La Jolla one of the most desirable and visited locations in all of California. Or, you can take a quick 1-minute walk down to La Jolla Cove and enjoy all the natural beauty that this marine sanctuary has to offer. La Jolla Cove is truly an amazing location as it offers world class diving and kayaking, as well as some of the most picturesque beaches and parks in all of California. Careful preservation of this recently remodeled stand-alone 1 bath 1 bedroom 528 sq. 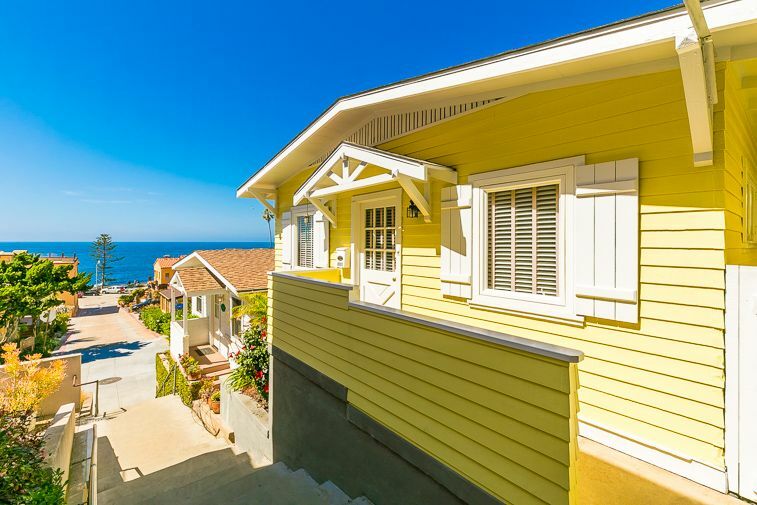 ft. cottage built in the 1930’s combines La Jolla’s historic character and charm with modern day comforts making this a relaxing getaway - as everything you need is in easy walking distance. The beauty and serenity of this seaside haven is enhanced with beach chic decor and ocean views from both the living and bedroom. The bedroom has a queen bed and the living room has a queen pull-out couch so this cottage comfortably sleeps 4. There is a large flat screen wall mounted TV in the living room. An updated kitchen provides everything you need to meet your culinary desires. The updated bath has a large walk-in shower. Premiere linens are provided for both the beds and the bathroom to ensure your ultimate comfort. This cottage does not have A/C but does have its own private parking spot, as well as an outside washer and dryer, and WI-FI and cable. There is also a small barbecue for your use as well. Its amazing location where you can park and walk anywhere. It is very affordable for a seaside cottage in this area - perfect for small families or a romantic getaway for one or two couples. If available, other cottages can be rented together for a group of 8 or 9. This cottage and 8007 are just one door down from one another. THINGS YOU SHOULD KNOW ABOUT THIS PROPERTY! The house sits on a narrow lane, up several stairs, so accessing the house requires being able to walk about half a city block uphill if you are coming from the beach, downhill if you are coming from town. This does not have a full size refrigerator, just an under-the-counter one. Also there is no outdoor seating, so you may wish to enjoy some of your meals in the village. Parking is in a public parking lot a block away. A parking pass is included for 1 vehicle in each unit. Street parking is very limited. Great digs right in the heart of La Jolla! My boys and I stayed here for over a week for a vacation recently. The home was perfectly positioned in the heart of La Jolla with a 30 second walk to the beach and sea lions, and a 30 second walk to all of the shops and restaurants. The house was super clean and had all of the amenities we needed. I highly recommend this place. Charmingly imperfect in all the right ways! La Jolla is famously a high-end community and its ideal location and extravagance can be somewhat intimidating, so I was a little nervous about fitting in; however, those nerves were put to ease the moment I walked into our bungalow. Simply put, it felt like home. The accommodations were warm and comfortable. The finishes were such that we weren't afraid to get comfortable in the home for the week we were there. Our bungalow had all the right squeaks, cracks, and noises that a well-loved, vintage beach house should have. At home, we are constantly improving our house, but this vacation reminded us that it's not the house that matters...it's the memories you make in it that really count. The location was perfect - walking distance to everything. Restaurants, coffee houses, even a grocery store are a very short walk from the property. Dining can be a bit expensive, but portions and quality are such, that my wife and I were happy to share meals. We chose carefully, but our most expensive non-shared meal was around $65. Fine dining options, of course, would be more, but we were never unhappy with our choices (The Living Room, Bernini's, Cody's, Karl Strauss, Gelateria, etc.). The grocery store (Von's) is affordable and the kitchen is big enough to prepare meals. The refrigerator is small, so plan on multiple trips to the store or maybe plan your meals accordingly. Laundry facilities are provided on-site, so feel free to pack light. This saves room for the shopping you'll be doing anyway! I was pleased with how welcoming everyone was in the shops on Girard Ave. Don't miss the photography galleries or Warwick's Book Store! Structured parking is provided, however, the on-street option was just as convenient and safe. The parking structure is a couple blocks from the property and the spaces you'll be allowed to use are really tight, so I would discourage large vehicles. Also, the structure does close at 7:30 p.m. every night, so you won't be able to access your vehicle or the garage after that time - generally, this isn't a problem, since on-street parking is pretty easy to find at night. The stairs to the property were a little steep and the landings are not level, so please keep this in mind if you have special limitations when planning your trip, otherwise prepare for a great time. This was by far the most relaxing and peaceful experience my wife and I have had in years. I hope to return this time next year. What a terrific location...smack in the middle of La Jolla, but very private and quiet! This small cottage was perfect for the two of us. We walked through town and along the coast in the morning, and made a point of watching the sunset each evening at the Sea Lion Cove! We enjoyed the ocean view out of the living room window. make our stay at this property an annual event!